There is something a little less savoury that they don’t tell you in the guidebooks about Galicia – that it is a major entry point for drugs, not only for Spain, but for the whole of Europe. The same little idyllic beaches, hidden coves and inviting ‘Rias’ also provide the perfect landing grounds for the small boats of the international drugs trade. To the naked eye there is very little evidence of this, apart from the occasional road blocks on our local roads and motorways. Traffic is filtered down to a walking pace as you are obliged to weave your way through hoards of police vehicles, whilst being surveyed by heavily armed police (some wearing face masks). All a bit sinister…. This local ‘trade’ is so widely acknowledged that the Spanish TV channel Antenna 3 actually makes a highly acclaimed drama series about it – Fariña (which means ‘flour’ in Gallego – the slang word for cocaine). Obviously it is set, and filmed in Galicia, using almost exclusively Galician actors. In fact, it is so local that they were actually filming in our own street last Friday. 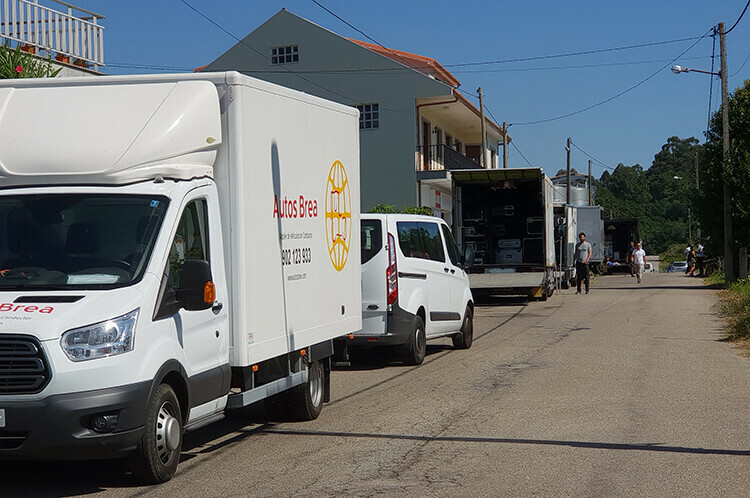 The road was closed intermittently for periods of the day, and to be honest it was a bit of a struggle to stop them filling our bodega car park with their vehicles. Unfortunately, they did not film immediately in front of our building, and so the hours that I spent applying make-up were completely wasted!